The wall-crawling robot Abigaille can thank the gecko for her sticky feet. Meet Abigaille: a six-legged gecko-inspired robot that may one day climb walls in space. The wall-crawling gecko robot is still in its experimental phase, but its creators hope Abigaille will give rise to automatons that can dexterously crawl around the hull of a spaceship. Engineers from Canada and the European Space Agency looked to geckos to make adhesive robot feet that wouldn't shed their sticking power in the harsh vacuum of space. "This approach is an example of 'biomimicry,' taking engineering solutions from the natural world," Michael Henrey of Canada's Simon Fraser University said in a statement. "Scotch, duct or pressure-sensitive tape would collect dust, reducing their stickiness over time," Henrey explained. "They would also give off fumes in vacuum conditions, which is a big no-no because it might affect delicate spacecraft systems." 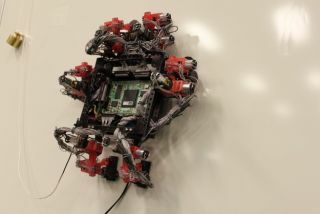 A close-up of one of the Abigaille wall-crawler robot's six feet, which has six degrees of freedom for agile climbing and dry adhesives on its footpad to keep it stuck to surfaces. Velcro, meanwhile, requires a mating surface to stick, and magnets, which can't stick to composites anyway, might affect sensitive instruments, Henrey added. But geckos might hold the solution. The creatures are famous for their ability to walk on walls and even ceilings thanks to their sticky feet. Geckos' footpads are packed with hundreds of microscopic fibers that get so close to the tiny crevices of a surface that the forces of attraction between atoms come into play. Henrey and colleagues made "footpad terminators" for Abigaille modeled after the thin fibers that give rise to the gecko's impressive grip. This image shows a microscopic view of the mushroom-shaped 'footpad terminators' on wall-crawling robots. The footpads are inspired by geckos and are made using techniques from the microelectronics industry. "Technical limitations mean these are around 100 times larger than a gecko's hairs, but they are sufficient to support our robot's weight," Henrey said. And six legs give Abigaille four degrees of freedom, "so it should be handle environments that a wheeled robot could not," Henrey added in a statement. "For example, it can transition from the vertical to horizontal, which might be useful for going around a satellite or overcoming obstacles on the way." Abigaille apparently was put through her paces at ESA's Electrical Materials and Process Labs in the Netherlands and even tested in a vacuum chamber. So far, the robot is limited to relatively smooth man-made surfaces, ESA officials said, but the researchers are working on improving the gecko-bot's performance.